This week’s Featured Application come to us from Jeff Lazaros with Michigan Synthetic Turf Solutions in St. John’s, Michigan. 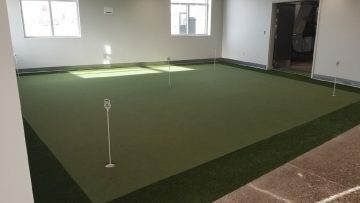 Jeff and his team installed a turf for the Katke Club House indoor golf facility at Ferris State University in Big Rapids, Michigan. 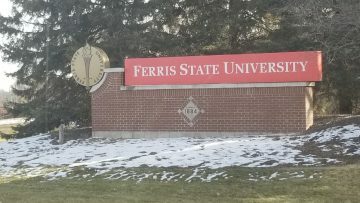 Ferris State University has an enrollment of more that 14,000 students and their golf team competes at the NCAA Division II level. 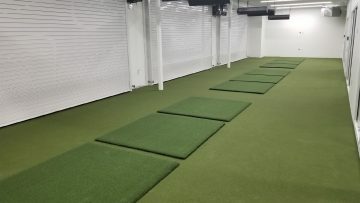 The facility has nine indoor, heated hitting bays. Jeff and his team used Synthetic Turf International’s EZTee Poly hitting mats for the bays. They laid the mats over NP 50 to provide a consistent surface and provide additional putting areas. The facility also boasts a 900 square feet NP 50 putting green. Ferris State is putting the finishing touches on the facility now. They’re hoping to have it open when students return for the Spring semester. The Bulldog golf teams last played before the facility opened, and begin play again in early March.